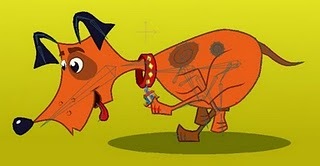 Dale Hemenway wrote an article in Animator number 24 telling how some of his cartoon sequences came to be shown on the BBC programme ‘Hartbeat’. The programme was hosted by Tony Hart, who had a unique approach to art. He featured many different styles of animation produced by young, freelance or independent animators. 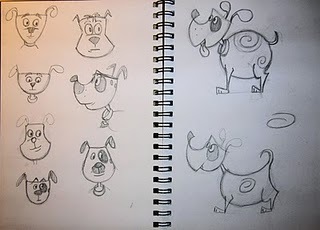 Sketches for Dale’s personal project featuring a dog and a flea. Dale wrote to me recently to tell me what he has been doing since the article was published. He made a short for Central TV, animated on the acclaimed children’s series Bob The Builder for 10 years, until the studio closed, and is now an animator on Lego videogames. He is also creating a 2D pilot film for a children’s series in his spare time. You can find out how Dale is getting on with the project on his blog called Short Progress. A frame of the dog running.